Today’s dose of wedding day pretty comes courtesy of Hannah and Graeme who tied the knot last July at the fabulous Iscoyd Park, a private country house on the borders of Wales, Shropshire and Cheshire, where we just so happen to be holding a Fine Art Wedding Show in partnership with our sister company UNVEILED in October – more details on that soon! 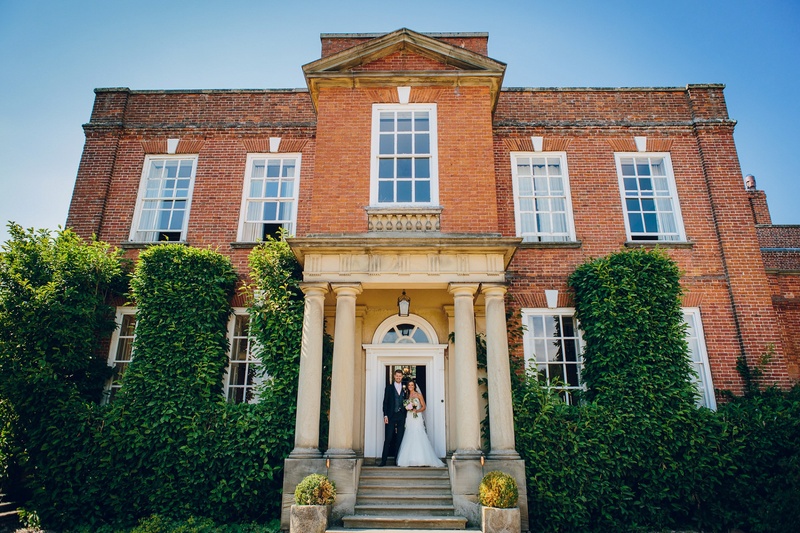 From the elegant décor to the magnificent grounds – Hannah and Graeme were instantly won over by this spectacular venue, which we think you’ll agree, is picture-perfect and then some! Complementing Iscoyd with a natural and romantic theme, the couple opted for a dreamy soft pink, white and gold colour palette with lots of greenery. 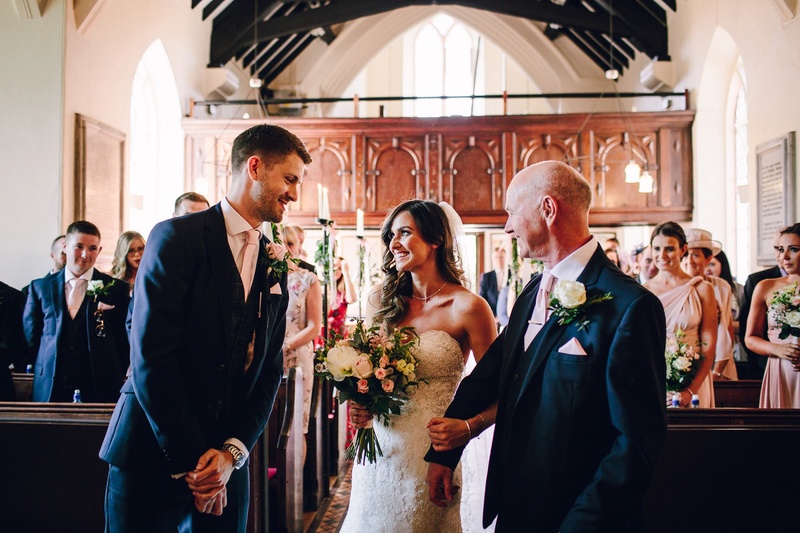 This was beautifully offset by some wonderful decorative touches and blooms, too – including candles adorned with roses and foliage in the church, and blossom trees inside the marquee. Foodie highlights to pore over include the super elegant three-tiered cake decorated with gold leaf, and an inspired choice by the newlyweds – a doughnut wall! With images by Amy B Photography. Hannah says: The proposal was a huge surprise whilst on holiday in our favourite city, Barcelona, in May 2016. Graeme was trying to find the perfect spot to propose when we were out exploring one day, and he suggested a trip to Park Guell on the way back to the hotel. After a wander around the park, Graeme found a quiet place away from the crowds with a beautiful view over the city to propose! I was overwhelmed and said yes immediately! We got married on 6th July 2018. We chose this date because we wanted to get married in the summer sun and thought it would be an easy one to remember; 06.07.2018! Our wedding venue was the beautiful Iscoyd Park. We saw it and fell in love straight away! After having a vision in my head of what I wanted for our wedding, Iscoyd Park ticked all the boxes and more; the elegant décor, the gorgeous grounds and the wow factor of a Georgian house in the countryside. One of the things I love most about Iscoyd Park is that as soon as you walk through the door you feel at home, as the staff who work at the venue are so welcoming! Our wedding ceremony took place at the beautiful little church near to Iscoyd Park, St Mary’s Whitewell. It was a pleasure to be able to get married there and Reverand Veronica, who married us, was fabulous. We wanted our wedding to have a natural and romantic feel to it to match the beautiful venue and didn’t want to take anything away from it, so we kept the style quite simple and elegant. After looking and lots of different ideas for a colour scheme and going OTT with Pinterest boards, we chose soft pinks with touches of white, gold and lots of greenery to complement the romantic theme. I chose a strapless fishtail dress from the Ella Rosa collection by Kenneth Winston. I had a completely different idea of what I wanted in my head but when I tried my dress on for the first time, I knew it was the one for me. I loved the detail on the bodice and how the skirt is so floaty and romantic. To go with the dress, I had a beautiful lace edged veil that was almost exactly the same as the lace on my dress. I finished off my outfit with some floral lace heeled sandals from Kate Spade. 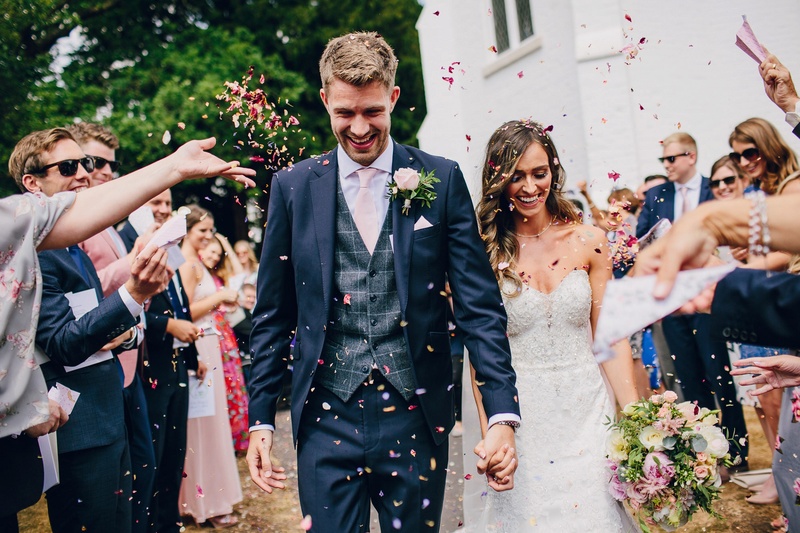 Graeme chose a bespoke navy suit teamed with a grey tweed waistcoat from Moss Bros which he had personalised with his initials on the inside of the suit jacket. He also had a soft pink lining added to his suit jacket and to the back of his waistcoat. The groomsmen all wore navy suits and waistcoats hired from Moss Bros. All of the male bridal party wore a blush pink tie too. For the bridesmaids, I had a clear idea of what I wanted for the colour, a blush pink, but it was just trying to find that colour on a dress. Whilst searching the internet I came across pink multi-way dresses from Debenhams and the colour was perfect. I teamed the dress up with pink satin shoes from Dune. For our hair and makeup we had the wonderful Penny, a member of Jodie A Smith’s hair and makeup team. Penny made us all feel very relaxed on the morning of the wedding and I was so happy with all of our hair and makeup She did an amazing job. Graeme chose the car we travelled in to and from the church. He picked an elegant Mk 2 Jaguar from Classic Wedding Cars Cheshire. Chris made sure that everything ran smoothly and turned up early on the day. The car was absolutely beautiful and the perfect way to travel to the church. Amy of Amy B Photography was incredible, she captured the day perfectly and still five months after the wedding I look at our photos nearly every day! We spent so long searching for the right photographer, as it was one of the most important aspects of the day for us. When I came across Amy I just loved everything about her photography style. Her photos are so colourful and full of life and emotion; it was exactly what we were looking for. 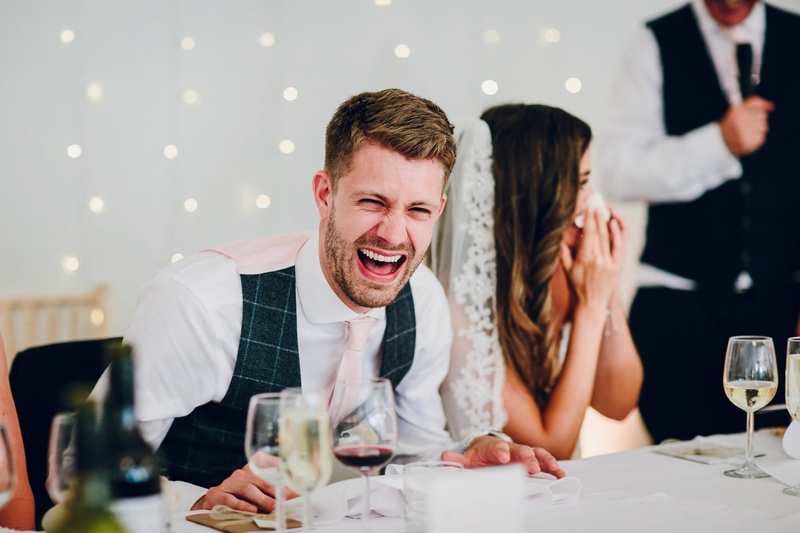 On the day Amy was incredible, she captured all the little moments that we had missed and even though we were a bit of an awkward couple to shoot (the height difference doesn’t help either) she made us feel completely at ease in front of the camera and we are made up with the final photos! We would 100% recommend Amy to everyone. We chose Portray Wedding Films for our videography and we are so happy that we did. Adam was fantastic on the run up to and on the day of the wedding. He captured everything we wanted in our film as well as the emotions, atmosphere and I think you can also tell how hot it was on the day as well! We’re so happy with how the videos turned out and couldn’t recommend Adam from Portray Wedding Films enough! My bouquet included a mixture of spray roses, astilbe, double lisianthus, hydrangeas, touches of gypsophila and lots of eucalyptus and dusty miller, and my favourite, peonies. My bridesmaids had a smaller version of this too. Chloe from White Wysteria in Whitchurch, did an amazing job with the flowers. She knew exactly what we wanted from the start with very little guidance from us and we were blown away with how beautiful the flowers were on the day. Chloe decorated the candles in the church with roses and foliage and the marquee with flowers and blossom trees. 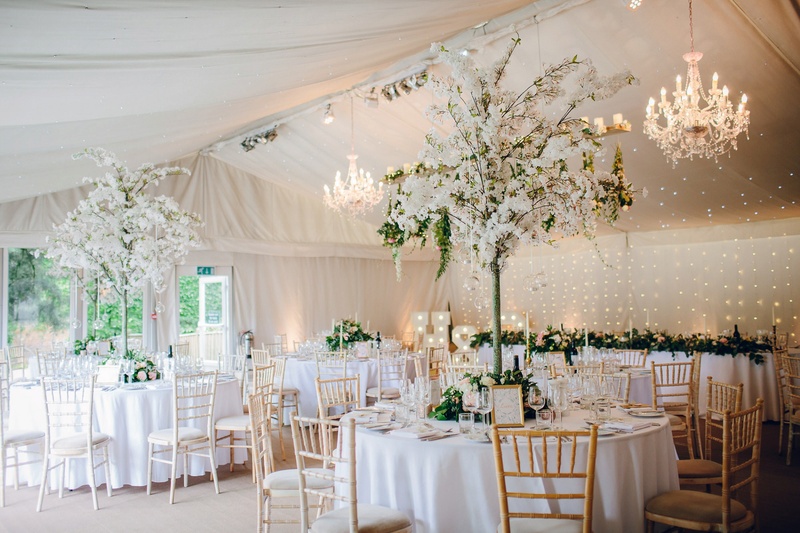 She also set up the most beautiful hanging feature from the ceiling in the marquee. Our favours were notebooks which I personalised with my own illustrations of Iscoyd Park and lots of pink flowers. They were printed by Awesome Merchandise and we tied place names around the notebooks with ribbon to add a finishing touch. We chose a three-tier white, gold and pink wedding cake decorated with the most beautiful sugar flowers and gold leaf. We asked a friend and colleague of Graeme’s, Lynne from Celia’s Cakes, to make the cake so it was bespoke and personalised to our taste. Lynne also made figures of us to go beside the cake which we loved! The food served in-house at Iscoyd Park is out of this world. Everything was so delicious, I wish I had more room in my dress to eat it all. For the wedding breakfast we chose a warm Belton cheese and onion tart served with a poached egg to start. For mains, we had rump of lamb with a herb crust. To finish off the delicious meal we had a cherry, chocolate and almond pave with milk ice cream. Everyone was wowed by the food and many people have said it’s the best wedding food they’ve tasted. Pizza was served in the evening from Iscoyd Park’s very own pizza van! The theatre of the pizzas being cooked in front of everyone added a little touch of wow. We had a string quartet play during the church ceremony and reception. The quartet, Sounds Interesting, added so much to the day and it was lovely to hear them play whilst chatting to guests and enjoying the beautiful sunshine in the grounds of Iscoyd Park. In the evening we had the amazing Callum McMorran and his band. He is a regular at the Cavern club and was also on The Voice with his other band, The Mac Bros. He puts a little personal twist on every song and even plays the jazz flute. The band did a fantastic job getting everyone on the dancefloor, we just didn’t want them to stop! For other special touches, we had love lights hired from Elegant Events and our initials in lights hired from The Added Extra. The photobooth we hired from Elegant Events went down a treat with our guests in the evening and gave them something to remember the day. I designed and printed all my wedding stationery for the day including the table and place names, table plan and anything else I could find to make! We also had a doughnut wall which I bought off Etsy and painted white and gold and our parents made delicious fudge for favours for our evening guests. From our first viewing at Iscoyd Park to our wedding day, the service we received was flawless. Will, our wedding coordinator, did everything possible to make sure our day was perfect and that it all went to plan. All the staff we came in to contact with at the venue were so helpful as well, and we had so many compliments from our guests on how beautiful the venue is and how delicious the food was! We would definitely recommend our venue to another couple. The wedding ceremony at St Mary’s Church was our favourite part of the day. It was everything we had ever dreamed of. We were obviously a little nervous but Reverend Veronica was just amazing at making us feel at ease. It was such a whirlwind and felt like it was over in a flash, but we loved and cherished every second of it. We went on a mini-moon to Palma a few days after the wedding so we didn’t get brought back down to earth straight away. We’ve booked to visit Sri Lanka and the Maldives on our main honeymoon in January. This has given us something to look forward to and has extended the wedding feeling as well as giving us two weeks of winter sun. We really wanted to do something once in a lifetime so have planned lots of exploring during our nine days in Sri Lanka and then total relaxation once we reach the Maldives. My top tip for other Brides Up North is, enjoy every little element of the planning and the lead up to the wedding and make the most out of family and friends who can help you with the little details, such as favours. We had lots of help from our parents, from adding final touches to our favours to helping me paint a doughnut wall!